The good news is that with the correct treatment and by making and maintaining the right dietary and lifestyle changes, you can manage and control your blood glucose levels effectively and in so doing delay the onset or prevent diabetes complications. To help you avoid and/or manage your risk for diabetes complications it is important to have regular scheduled visits with your attending physician. She will assess if your blood glucose levels are well managed, and will monitor whether elevated blood glucose are affecting specific body systems or organs adversely. Your doctor may also alter or add to your existing treatment when necessary to help delay or manage any long term complications associated with diabetes. It is worthwhile understanding what the long-term complications of diabetes are, so that you can know which body systems can benefit from good glucose control. Diabetes significantly increases your risk for coronary artery disease, heart attack, stroke, and high blood pressure. This is because elevated blood glucose levels can damage the lining of blood vessels and can unfavorably affect the metabolism of blood cholesterol and lipid levels. The affect of diabetes on your risk for developing coronary heart disease is so significant that medically doctors are advised to treat people with diabetes as if they have already had a heart attack. For this reason your doctor may advise that you take medications sooner rather than later to manage your blood pressure and/or cholesterol levels if you have diabetes. It is important to recognize that a healthy diet and lifestyle will also help to manage high blood pressure and cholesterol levels if you have been diagnosed with these conditions. We all have tiny blood vessels (capillaries) in our body that nourish the nerves by carrying oxygen and nutrients in the blood to them. 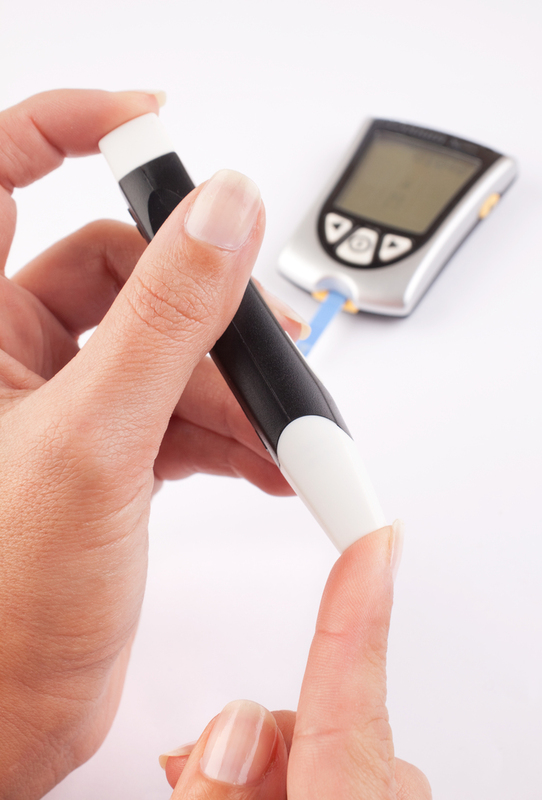 High blood glucose levels can injure these capillary walls, and can also interfere with the ability of the nerves to submit signals, especially in the legs. These begin at the tips of the toes or fingers and gradually spread upward. Eventually you can lose all sensation in the affected limbs if blood glucose levels are poorly controlled. Inspecting your feet and legs for cuts and blisters is very important. Damaged nerves can also cause problems with balance, erectile dysfunction and with your digestive and urinary tract. The kidneys are other vital organs that can be affected by diabetes. They have many tiny capillaries that act like filters to remove waste products from your blood to be expelled from your body as part of your urine. High blood glucose levels can damage how this filtering system works. With kidney damage, waste products and fluid are not properly removed from your body and build up in the blood. When this starts to happen, it indicates that the kidneys are failing. Kidney failure is a serious condition and will require dialysis (which is a machine that filters your blood for you) or a kidney transplant. High blood glucose levels can damage the blood vessels of light-sensitive tissue in the back of your eyes (retina). Diabetic retinopathy is the leading cause of blindness in American adults. Diabetes also increases the risk of other serious vision conditions, such as cataracts and glaucoma. Diabetes places you at risk for skin problems, including bacterial and fungal infections. Because diabetes increases your risk for damages to blood vessels and nerves, this can also reduce blood flow to the skin. This can prevent your skin from being able to heal. By following the skin care routine advised by your doctor and controlling blood glucose levels, you can help prevent skin problems from worsening. Make regular visits with your doctor or healthcare provider, so he or she can monitor your condition and pick up problems before they become too serious. Monitor your blood glucose levels daily and in accordance with the schedule recommended by your doctor or healthcare provider. If blood glucose levels are regularly outside recommended levels (70–130 mg/dl before a meal, and less than 180 mg/dl 1-2 hours after the beginning of a meal) then seek the assistance of your provider to help you bring blood glucose levels back down to acceptable levels. Take all medication as prescribed by your doctor or health care provider. Report any symptoms or side effects you think are related to the medication you are taking. If you are overweight, reducing body weight can significantly help you to manage your blood glucose levels more effectively. A 5-10% weight loss can have a powerful impact on your ability to regulate your blood glucose levels. Regular physical activity is highly beneficial and can help you to manage your blood glucose levels more effectively. If you have not exercised for some time, you should ask your doctor first if it is acceptable for you to start an exercise program. A good guideline is to build up to 30 minutes of regular exercise daily on most days of the week or at least 5 days per week. Start slowly and get advice and support when you need it. Follow a healthy diet. People with diabetes need to take extra care to make sure they get the nutrients they need to help them manage their diabetes and reduce their risk for complications. An adequate intake of vitamins, minerals and antioxidants can be very beneficial. In addition, a diabetic meal plan that helps you to distribute carbohydrates evenly throughout the day can help you control blood glucose levels effectively. At Lifestyle Medical Center we have a team of licensed dietitians and nurse practitioners that are ready to help you learn how to manage your diabetes well. Our lifestyle plans will help you gain control over your blood glucose levels, and in so doing help you to reduce your risk for developing long term complications of diabetes.